This urban mountain bike park aims to give riders a place to hone their skills, regardless of their current skill levels. Great for all riders! None, although donations are welcome. It would be easy to pass right by the I-5 Colonnade without giving it a second thought. But the once grungy space beneath this highway overpass is unquestionably worth a deeper look. The 7.5-acre park is home to one of the city’s most creative uses of public land: the I-5 Colonnade Mountain Bike Skills Park. For its relatively small acreage, the I-5 Colonnade packs a lot of punch. Whether you are a mountain biking newb or a master, you will find more than enough here to get in a good session. Beginners can learn the ropes on the Tqalu Trail, which has gentle feature like a gentle ladder bridge, rock chute, log rolls, and skinnies. Intermediate and advanced riders rave about the Limestone Loop, a half mile cross-country trail with tight twists and turns as well as rock step-ups, steep rock chutes, technical rock rolls, and a suspension bridge. Practiced thrill seekers will want to head for the jump zone, where you will find six-foot drops, high-banked berms, skinny bridges and high jumps. Even if you’re not there yet yourself, you will feel your jaw drop just watching the practiced riders navigate these gnarly features. There are also other short cross-country trails and skill building elements in between; warm up by riding around them as you scope out the whole park. 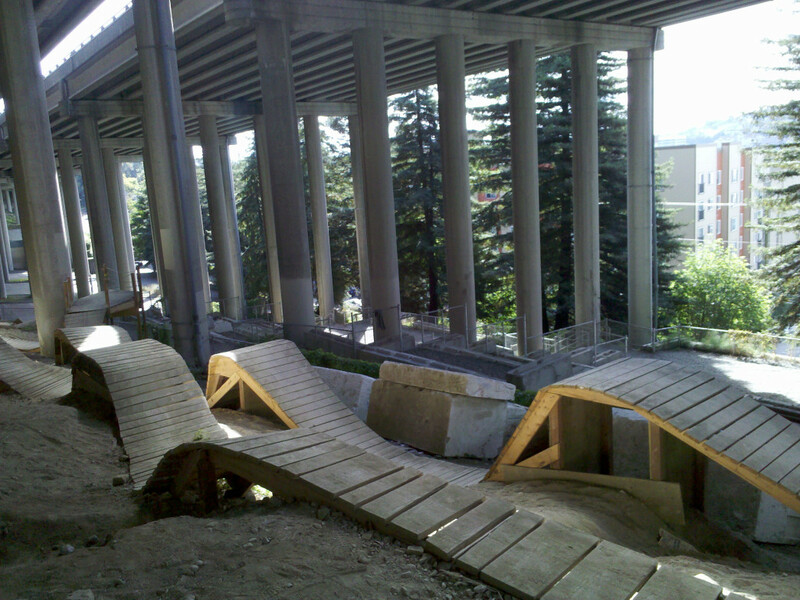 When the park opened in 2005, it was the first urban mountain bike skills park. 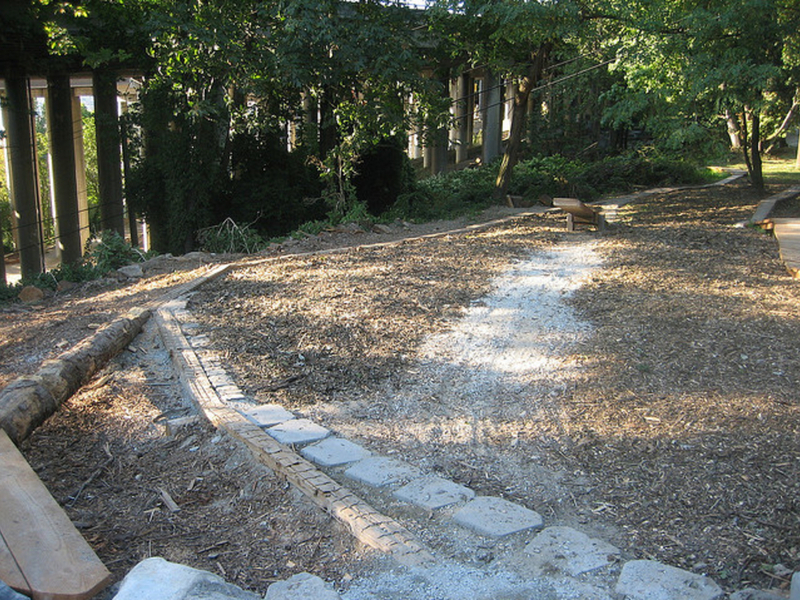 While it is operated under the umbrella of Seattle Parks and Recreation, it exists thanks to the funding and construction efforts of the Evergreen Mountain Bike Alliance. It has served as a model for many of the urban mountain bike skills parks that now exist in the country today. The space may be small and neighborhoodly, but the terrain can still pose quite the challenge. Remember to wear a helmet – you will probably even want a full-face helmet and even body armor if you plan to play on the advanced features. In addition to the mountain bike park, the I-5 Colonnade has a dog park, walking/jogging paths, and some steep stairs to run if you want to get in your cardio. 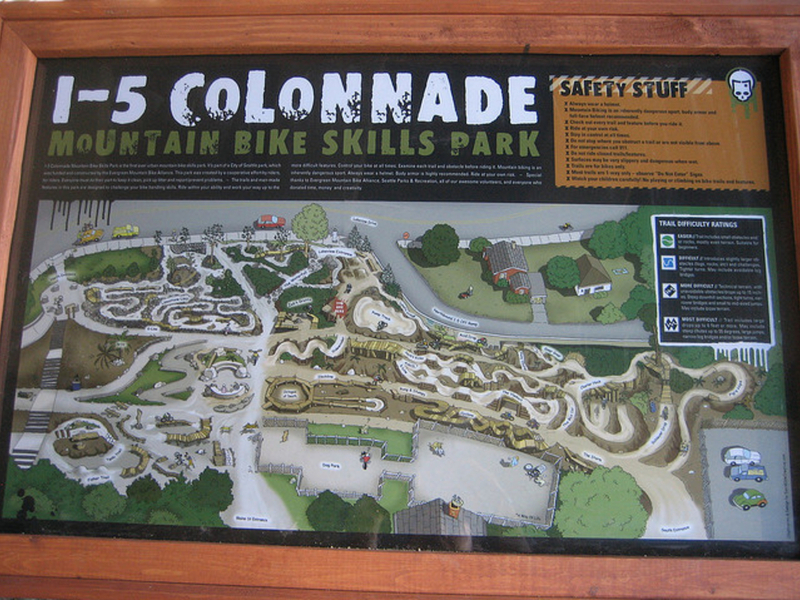 Seattle-based mountain bikers will love the I-5 Colonnade for its accessibility and quality; it is a place you can come to again and again as you build your skills. Non-bikers will love it for its ingenuity and the reclamation of a formerly forgotten piece of land. Park your car on the street just outside the park (unlike much of the neighboring Capitol Hill, it shouldn't be too hard to find a spot). The park is open from 4 a.m. to 11:30 p.m.